Well...I'm back from my adventures to the Pacific Northwest, and while it's so very nice to travel, it's oh so nice to be home! I've finally unpacked all of my stuff, and I sure hope to get some time to sew over this long holiday weekend! You, too?? Well....here are your next two blocks, just in time for those extra days off. Draw a diagonal line on the wrong side of all (8) 2" light print Connector Corner squares. Pair with the (4) 2" x 3 1/2" rectangles to make (4) Flying Geese that should measure 2" x 3 1/2" unfinished. Arrange the units for the block as shown. The construction for this type of block is a bit different than usual, but not difficult at all. 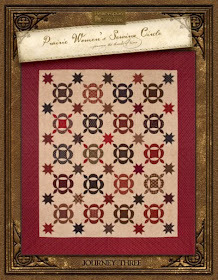 With right sides together, sew a Flying Geese unit to the center pink square. Sew a seam only 1" in length, then stop. Finger press to the Flying Geese unit. Sew a Flying Geese unit to the top of the previous unit. In all cases, press to the Flying Geese. 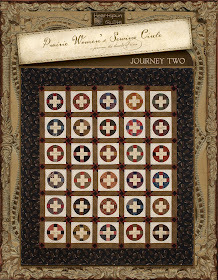 Continue in the same manner, sewing the third and fourth Flying Geese units to the pink center square. Fold the first Flying Geese unit right sides together, and align the raw edges, to sew and complete the seam, and finish the block. Your block should measure 5" unfinished. *Draw a diagonal line on the wrong side of (2) 2" light print﻿ #2 squares. Match with the (2) 2" pink print squares to make HST that should measure 1 5/8" unfinished. *Draw a diagonal line on the wrong side of (4) 1" Light print #1 squares, and (4) 1 5/8" Light print #2 squares. All will be used as Connector Corners. *Sew the two units together. Make (4) units that should measure 2 3/4" unfinished. *Arrange the units for the block as shown. Sew together into rows; press. Sew rows together; press. Your block should measure 5" unfinished. Scratch Alaska from my Bucket List! We have returned from our quilting cruise adventure to the Pacific Northwest. It was a wonderful working vacation filled with all kinds of new experiences. The photo above was the highlight of the travel portion, with hubby and me standing on the Mendenhal Glacier, in Juneau. We took a helicopter ride (awesome!) and landed on the glacier where we were given a short guided tour. Words just cannot adequately express how grand this experience is. The glacier is really a tropical ocean blue all over, as you can see in the opening of this 60' crevasse. There were waterfalls and running streams just under the surface, with the purest water and air I've ever experienced. Absolutely amazing and I'm so very glad we did it!! Our time in Alaska was fun, but a bit disappointing, only because it was so foggy and rainy most of the time. The fog and clouds lay so close to the ground that it made for very poor visibility. That's Alaska at this time of year, we were told. The four days before boarding the ship were spent touring Mount Rainier, Vancouver, BC, and the Seattle area. We met Lynne & Robert Hagmeier on Thursday, and went to Snohomish, WA for a day of antiquing which was very fun. The four of us bummed around Seattle the rest of the time, hanging out at Pike's Market and enjoying the many dining options Seattle has to offer. All in all, I have nothing but good things to say about our time in the Northwest, except that there was a virus going around some of the hotels in Seattle, and about 1/3 of the people who boarded the ship brought the virus with them, including my husband. He was very ill, and confined to our cabin the first day at sea.....and then promptly gave it to me. Thanks, honey! I missed the second day of classes on board, which luckily was Lynne's day to teach, but I still feel I missed out on a lot. (Pout....sigh) What can you do? 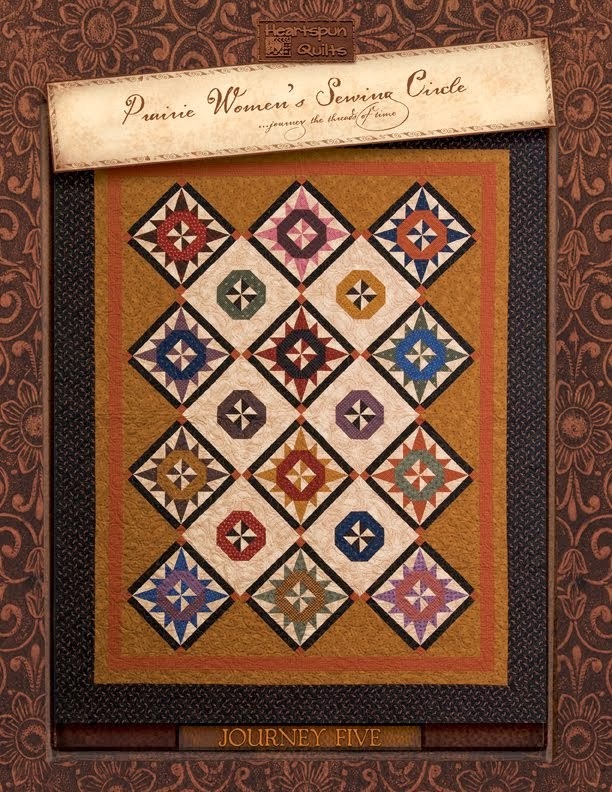 Think quilters are boring people? Think again!!!! This group of quilters who joined us on our cruise all made matching T-shirts to wear their first day on board. They're all from The Gathering Room quilt shop in La Grange, KY. Oh....yes...this was a fun group of people to get to hang out with on our cruise. We had a great group of 33 ladies and 1 gent who pieced a their way to and from Alaska during their week on the cruise. ....and our quilting friends had lots and lots of open sewing time in our classroom while the ship was en route. There were several people who completed 2 of the 3 projects before we left for home! Amazing!! Lynne & I can't wait to cruise with quilters again.....and apparently this group really enjoyed themselves because more than half of them signed up to join us next year as we cruise to New England!! We couldn't be happier! Had to share a few more photos with you. The photo above was taken at a camp at the base of Yukon trail c. 1895. There, hopeful folks would prepare for the arduous journey up a very steep and dangerous mountain pass on their quest to mine for gold. I immediately noticed the "prairie pocket" hanging from the bedpost! I did get a closer look at it, but didn't have enough time to take an up-close photo. It was way cool!! Another tent housed a treadle sewing machine. Ya never know when you might have a moment to sew a new frock, or piece a block! Yes....a pink, frilly frock was just what was needed in the super cold, muddy, snowy, brutal Yukon Territory. Oh, well, a girl has to do what a girl has to do!! All in all, it was a most-memorable working vacation. We thoroughly enjoyed our time with all of our new friends on the cruise who made the trip more fun than words can say. Thank you to each of them....lots and lots of laughter, and good times we won't soon forget. It was great to spend a good 10 days with my pal, Lynne, and Robert, which is something we don't often get to do! Do stop over to Lynne's blog for more details and photos from Alaska, and please consider joining us on our next Great Girlfriend Getaway to New England for the 2013 Fall colors. If you're thinking about it, you may want to get your name on the list as we only have about 6 spaces left!! Hhmm......I heard the dryer buzzer calling. Yup....vacation is over! It's Friday, and we meet once again for another installment of our sew-along. I'm actually on board the ship with Lynne, and have been out of internet touch with everyone for a bit. I'm anxious to get home to see if you've left me any comments on how you like the sew-along so far. Well....enough of that....let's get to sewing! Cutting and sewing instructions for Part Five. *Cut (4) 1 1/2" x 3" rectangles. *Cut (1) 2 1/8" square for HST. *Cut (2) 1 3/4" squares. *Cut (4) 1 1/2" squares. *Draw a diagonal line on the wrong side of the pink 2 1/8" square. Match with the blue 2 1/8" square to make a HST. Make (2) HST that should measure 1 3/4" unfinished. *Sew the (2) HST to the (2) pink 1 3/4" squares; press. Sew them together; press. This unit should measure 3" unfinished. *Arrange the units for the block and shown. *Sew the units into rows; press. Sew the rows together to make a block that should measure 5" unfinished. Here's the cutting instructions for Part Six. *Cut (1) 1 1/4" x 6" strip. *Cut (2) 1 1/4" x 6" strips. *Cut (1) 2" square for block center. *Draw a diagonal line on the wrong side (2) 2 3/8" light squares. Match with (2) green 2 3/8" squares to make HST. Make (4) HST that should measure 2" unfinished. *Sew a light print strip to a pink print strip; press to the pink. Repeat with the blue and remaining pink strip. * Cut a 1/4" piece to get a clean edge, then subcut (4) 1 1/4" Two-Patch units from each strip set. *Sew Two-patch units into (4) Four-Patch units﻿ as shown. Four Patches should measure 2" unfinished. *Sew units into rows; press. Sew rows together to make a block that should measure 5" unfinished. Yup....we're cooking right along with our quilt! This means that half of the blocks are done. Already? Hubby and I had just a wonderful time in the Seattle area these last few days. It was my first time to Washington state and I was not disappointed in the least. Yesterday and today we bummed around with Lynne and Robert, taking in the city life of downtown Seattle. We loved Pike's Market and did lots of shopping among the many vendors there. Besides all of the fresh fish (hubby's favorite), there were tons of fresh fruit & veggie vendors. Their offerings were not only lovely to took at, but we're so yummy at the peak of ripeness. And...if that wasn't enough to fill your senses, the many, many booths of flowers put you over the edge!! Each of these bouquets were only $5 or $10!! We wanted to buy bunches of them, but couldn't see how we'd manage boarding the ship with all the flowers AND 8 pieces of luggage and 20 boxes. We leave Seattle with wonderful memories and board the NCL Pearl ready to make more memories. I don't think we'll be able to blog while sailing, but rest assured that we will be taking loads of pictures to show you once we get home. Do check out my Facebook page as I am easily able to post there when we're in port. *Cut (4) 2 3/8" squares for HST. *Draw a diagonal line on the wrong side of all (4) 2 3/8" light squares. Match with (2) blue and (2) green 2 3/8" squares to make HST. *Make (4) green and (4) blue HST that should measure 2" unfinished. *Arrange the units for the block as shown, sewing them into rows; press for opposing seams. Sew rows together; press. Your block should measure 5" unfinished. *Draw a diagonal line on the wrong side of (3) 2 3/8" squares. Match with (3) pink 2 3/8" squares to make HST. Make (6) pink HST that should measure 2" unfinished. 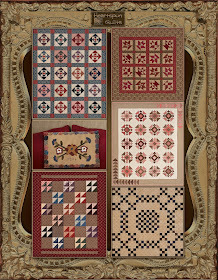 *Arrange the units for the block as show and sew together into rows; press for opposing seams. Sew the rows together to complete the block. Your block should measure 5" unfinished. Great Girlfriend Getaway to Alaska!! Great Girlfriend Getaways in 2013!! Click here to see where we're going. I'll post pictures and news once we're home. My hubby and I arrived in Seattle yesterday after an uneventful flight ( the best kind!) with our four pieces of luggage waiting for us in baggage claim. Huge sigh of relief. Not sure which I was happier to see...the suitcase with my clothes or quilts! With only a few days to play, we got our car and hit the road taking off for MHD first wish...to see Mount Ranier. We literally drove the road to Paradise, taking us to get a better look at her majesty. Lots of lovely things to see along the way. It was all beautiful and a perfect introduction to the Pacific Northwest. On today's schedule, we are headed to Vancouver, and my first time stepping foot in Canada!! Perhaps a stop at a quilt shop is called for?? Hhmmmm....yes...I think that would round off the day nicely! Seattle, Alaska & Glaciers.....Here We Come! Hard to believe that it's time to pack our bags and leave for the great Pacific Northwest! Lynne and I started planning this trip about 18 months ago, and here it is....time to make our way to Alaska. It's been on our Bucket List so long, I can't remember a time when it wasn't there. The weather there will be cool and rainy. Not too happy about the rain, but so looking forward to the cooler temps. First, we'll spend a few days bumming around Seattle. Pikes Place Market, Mount Rainer, the Space Needle, Fisherman's Warf....all kinds of new things await. Isn't that the best part about vacation? It's supposed to be sunny and in the 80's while we're in Seattle. I can't wait to see the ocean!!!! On Sunday we board the NCL Pearl, along with 34 BFF quilter's, along with 16 significant others, bound for Alaska. We are expecting highs in the 60's and lows in the 50's....except for the times when we're standing on a glacier! WOW...I can't wait. For that, I packed full winter weather gear. My suit case has shorts and sandles, winter parka and mittens. I'm so up for it all!! The third project for our Great Girlfriend Getaway has been kept secret....until now! Lynne and I had a great time collaborating on this project, named Friendship Garden. We made two versions. Lynne's version features her raw-edge applique technique that she is so well known for, and my version features a combination of wool applique and English paper pieced hexagons. 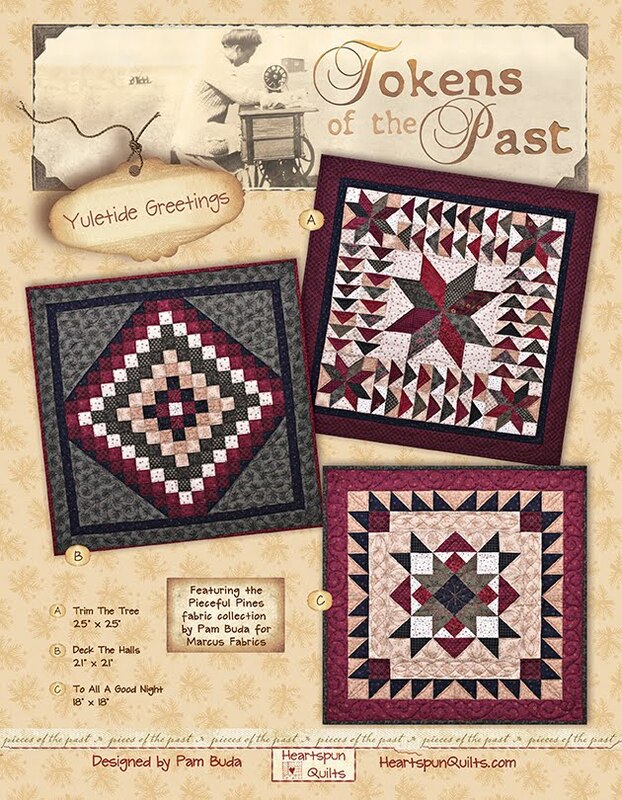 If you hop on over to Lynne's Blog, you can comment to win the pattern and a kit of this project, which is otherwise only available to our friends on the cruise. We will both try to blog about our adventures, Wi-Fi permitting! arrive on the Fridays I'm away. Wish us happy, "still water " sailing! Welcome to my second Pocket Patchwork Sew-along! I've been working on this event for awhile now, and I'm so glad it's finally time to begin. We will be making two blocks every week, and the sew-along will last 8 weeks with instructions coming every Friday. So.....without further adieu....let's get started! Here's your cutting and sewing instructions for Part One. *Cut (4) 1 5/8" squares. *Cut (3) 2" squares for Half Square Triangles (HST). *Cut (2) 2" squares ~ crosscut once on diagonal. *Cut (2) 2" squares for HST. *Cut (1) 3 1/8" square ~ crosscut once on diagonal. 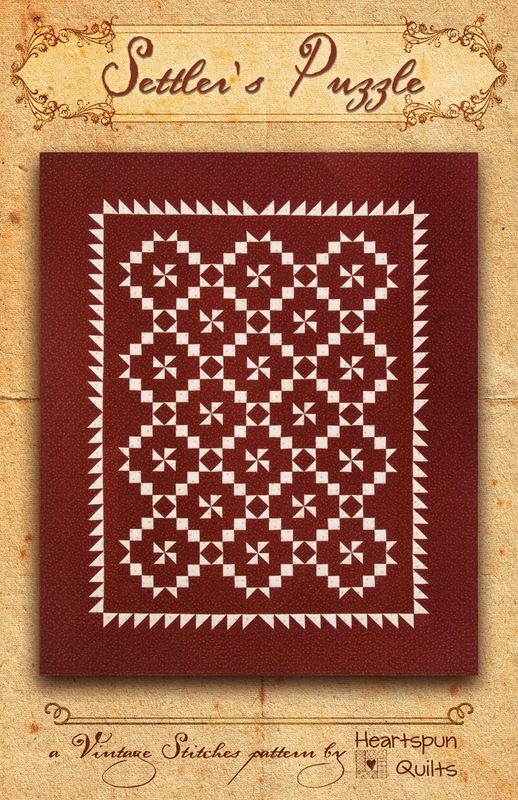 *Draw a diagonal line on (3) 2" light print squares. Match with (2) pink and (1) green 2" square to make HST. Make (4) pink and (2) green HST that should measure 1 5/8" unfinished. *Sew (2) crosscut 2" light print triangles to each side of a pink HST. Press to light triangles. *Sew a blue crosscut triangle to the previous unit. Press to blue triangle. Make (2) units that should measure 2 3/4" unfinished. *Sew a 1 5/8" light print square to the pink & green HST; press to the square. Sew pairs together; press. Unit should measure 2 3/4" unfinished. *Sew the four units together; press. Block should measure 5" unfinished. Here's your cutting and sewing instructions for Part Two. *Cut (1) 3 1/2" square ~ crosscut twice on diagonal. *Cut (2) 3 1/8" squares ~ crosscut each once on diagonal. 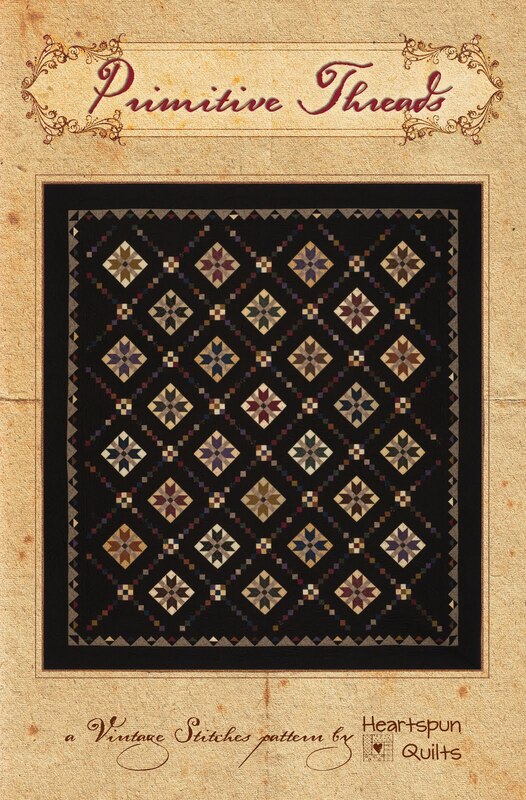 *Sew each blue triangle to each light print triangle; press to blue. Make (4). *Sew the four units together; press with opposing seams. Your block should measure 5" unfinished. What a great start to our sew-along! See you again next Friday for two more fun blocks. 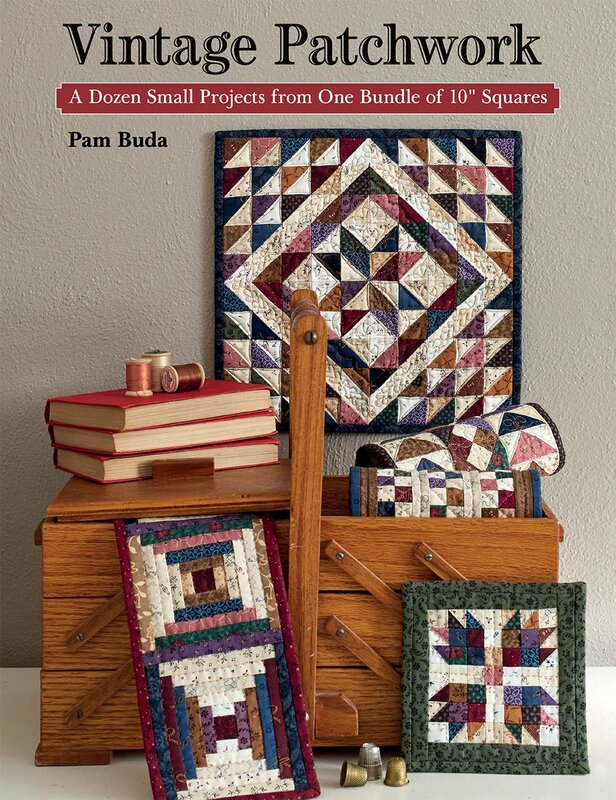 Tomorrow, my second Pocket Patchwork Sew-along begins, and I'd like to take a few moments to tell you a few things about it. 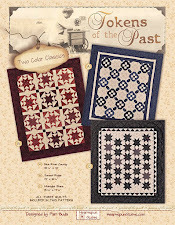 First, I'd like to thank all of you who ordered a Forget Me Not kit! Your response was overwhelming! I had no idea what to expect, and you all blew me away....and I thank you so very much!! After a second round of kit cutting to meet the demand, I have just a handful of kits left, so if you're thinking about getting one, don't delay. Once they're gone...they're gone. Whether you purchased a kit, or have pulled fabrics from your stash...you should know the yardage amounts given have been tested. You will use some fabrics only once, and others multiple times....so please, cut carefully and sparingly. In case of a mistake, there's adequate fabric to make a few substitutions. I really watched the fabric amounts, trying not to overdue, because fabric is so expensive, and I wanted you to have enough, of course, without too much left for scrap. 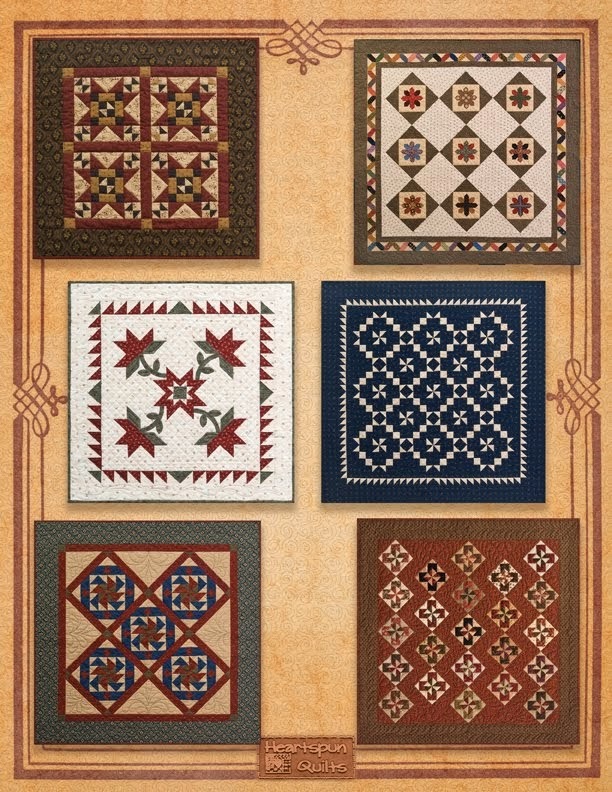 All twelve of the quilt blocks will finish to 4.5 inches, and the quilt measures 18" x 27". Several of the blocks have Half Square Triangles and Flying Geese units. To save repetitive instructions, follow the directions below when making these units, unless instructed otherwise. *Draw a diagonal line on the wrong side of the light print. Sew 1/4 inch on each side of the drawn line. Cut apart and press to the dark, unless instructed otherwise. This will yield 2 Half Square Triangles (HST). *Draw a diagonal line on the wrong side of your light print connector corner squares. *Position at the end of a base rectangle and sew (scant) on the drawn line. Notice my red thread is positioned just a scant bit "inside" the seam allowance....helps a ton with accuracy! *Trim 1/4 inch seam allowance of both the base and the connector corner fabric. If it's a perfect match to the base, like it should be, there's no need to keep the fabric as it's just unwanted bulk!! 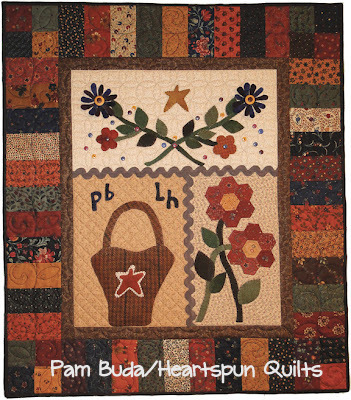 I have lots more tips about working with connector corners and oodles of other stuff in my Heartspun Quilts Hints Book. Click here to read more about it. 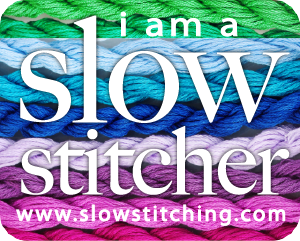 Please tell your friends that it's not too late to join the sew-along!! And...remember, the best and easiest way to receive all of the sew-along patterns (free!!) is via email! To do this, simply enter your email address in the "Follow by Email" icon, located in the right column of my blog. My blog posts will come as an email, and you can easily print them. As many of you know, I love working with small blocks, and I know not everyone does. 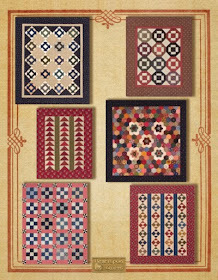 That started me wondering.....what is the smallest Nine-Patch block you are comfortable making? Vote your answer in my poll, at the top of the blog, in the right hand column! Your answer will give me a lot to think about in upcoming projects! with many quilting friends! Oh how I love it! Are you ready to begin sewing along with me? I'm soooo ready, too! I thought I would be able to begin the sew-along on Friday, but alas, like so many other things in my world, life got in the way, and I'm just not ready this Friday. However.....we're all set to begin the next Friday, August 10th....promise! So...here's the important information you've been waiting for. 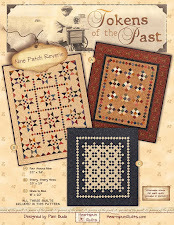 My next Pocket Patchwork Sew-along project is called, Forget Me Not, and is a 12 block sampler. A few weeks ago, I asked you to vote on how many weeks the sew-along should be, and the majority of you choose 8 weeks....so 8 weeks it is!! You'll receive instructions for 2 blocks each week, for 6 weeks, and then get the assembly instructions. I wanted to provide tested yardage information ahead of time, and get all of my instructions done, you know...blah, blah, boring stuff...and I'm all ready and raring to go. 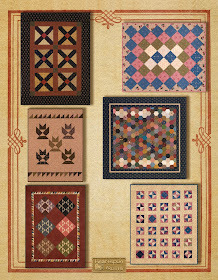 The fabrics I used for my quilt are......no surprise....my own Heart of the Prairie fabrics. And...for the first time ever....you can order a kit!! 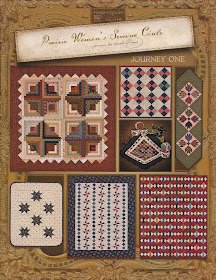 Click here to go to my website and order a kit that includes all fabrics for the quilt top, binding, and backing. The cost is $36.00 postage paid, and quantities are limited.....so don't delay. Your blocks will be made using the exact fabric I used.....what could be easier? For all 12 sampler blocks, you will need: (9) assorted light prints, (8) assorted medium prints, and (7) assorted dark prints that measure 7" x 10". 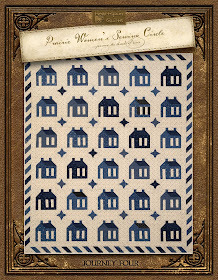 For quilt setting, you will need (1) medium print and (1) dark print that measures 6" x WOF. For binding, you need 1/4 yard, and 2/3 yard for backing. 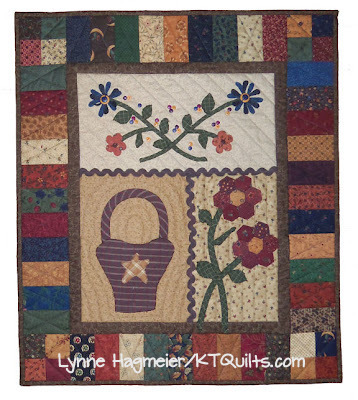 The quilt design lends itself nicely to a totally scrappy look, too, so if you'd like to pull fabrics just from your scrap bin, it will be just fine. All blocks are made with simple, modern rotary cutting and piecing techniques. From the yardage amounts listed above, you will use some of the fabrics more than others. Those are the last of your hints, my dear reader! Reminder: the easiest way to receive the patterns each week is via email. 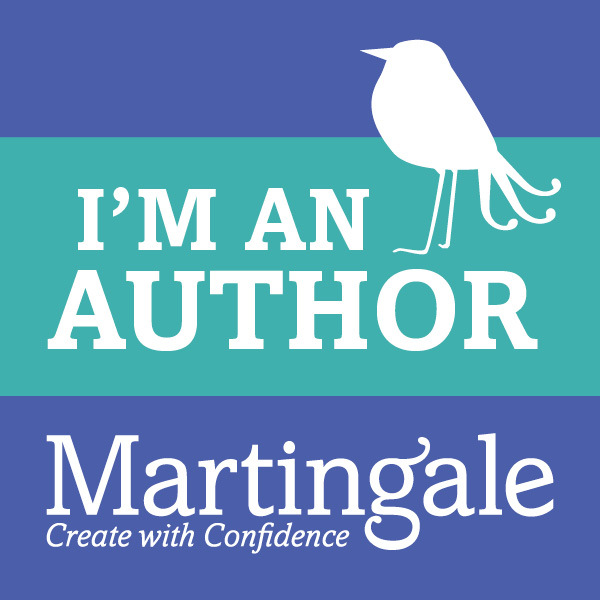 To receive my blog post as an email, simply type your email address in the "Follow by Email" icon, which can be found on the right column of my blog. That way, you can print the email and pattern instructions! are also available on my website! in your rotary cutter, and get ready. It's going to be a whole lot of fun! !